You can jump in your Javelin today. Anthem’s public demo kicks off today, running for the weekend. Despite the numerous issues that plagued the VIP demo, BioWare reckons this one is going to go a lot more smoothly, though players should still be prepared for new and returning issues. The Anthem team has been working on improving the player experience based on feedback and what they saw during the last demo weekend. 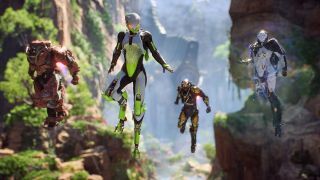 BioWare listed planned fixes for Anthem’s public demo earlier in the week, so hopefully players will be able to get through a couple of missions without getting trapped in a loading screen or some other disaster. In a recent blog post, head of live service Chad Robertson said that BioWare’s confident about the server load this time, too. During the VIP weekend, lots of players found themselves spending most of their time just waiting to play, and I’m not entirely convinced the same thing won’t happen again. “Like last weekend, we will be prepared with more server capacity than we anticipate will be needed,” the post reads. It doesn’t inspire much confidence given that they were pretty far off in their estimate last week, despite the fact that it was a limited demo with player numbers they could actually predict. This weekend, anyone can play. If there are more players than BioWare has anticipated, there are systems in place to “control entry rates of incoming players”. If you spend the weekend queueing, have you really had a weekend? Hopefully this time there will be some indication of how long you'll need to wait. Are any of you lot planning on braving it this weekend? If you didn't play last weekend, it might be worth it just so you can fly around and pretend to be Iron Man.